The Arjun Rampal starrer biopic on Arun Gawli is nothing but one of the boring chapters of a history book. After starting his directorial innings with a feature length documentary Jane and John in 2005, Ashim Ahluwalia created his own niche in his craft which later brought him fame at international platforms with his second film Miss Lovely in 2012. After five years, he is back with a crime saga set in 1970s which is closely based on the life of an infamous don Arun Gawli. How his life changes upside down when he faces off with an underworld mafia Dawood and emerges as a powerful god's man is what Daddy all about. 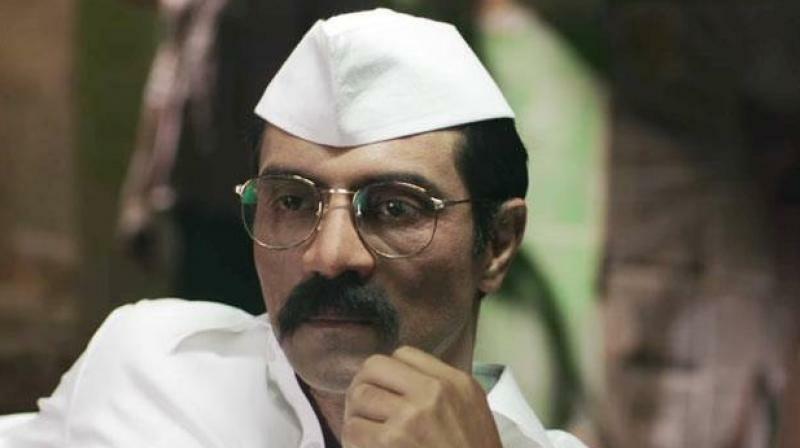 Arun Gawli aka Daddy (Arjun Rampal) stays in Dagdi chawl, Agripada and is involved in small-time criminal activities along with his gang consisting of Babu, Rama and Vijay. He is in love with his neighbour Zubeida (Aishwarya Rajesh) and plans to marry her. Unfortunately, Arun miffs the local goons at a bar and Dawood (Farhan Akhtar) saves him from imprisonment. In return, Dawood asks Arun to work for him. But destiny has other things store in for Arun. His life becomes difficult when Babu, Rama and Vijay die in police encounters and he has to become the caretaker. Things become worse when Arun confronts Dawood and tries to kill him. Meanwhile, inspector Vijaykar (Nishikant Kamat) chases Arun for all his crimes and finally puts him behind bars in 2012. Is Arun Gawli guilty of the charges he is accused of or he is a god's man for his disciples? Since Daddy is based on the life of a local gangster Arun Gawli, Ashim tries his best to recreate 1970s and he remains successful in technical aspects. The background score is the highlight of the film which will take you to that era. Costumes, hair and make up are too good. The art direction of the film is excellent. Once you reach the interval point, you will actually take a few seconds to come out of that era. The song 'Dance Dance' featuring Natasa Stankovic is conceptualised very well too. First half should have been a little pacier than what it is. It takes you on a detailed journey on the life of 'Daddy' which could have been easily chopped off a bit. However, the film is brilliantly shot, but again it is narrated in a very mediocre way. The film lacks mass appeal. A person sitting in the northern belt has no interest in knowing about Mumbai's local gangster, they have enough to read about already. Though previously, Milan Luthria's OUATIM which had a similar essence did well universally simply because it was about a much bigger don, Dawood. Second half of the film goes haywire. Looks like Ashim just loses his concentration in keeping the thriller element in the film. The film looks more like a boring documentary of 135 minutes about Arun Gawli. Arjun Rampal has surely added a lot of credibility to the story. His resemblance to Arun Gawli is par excellence. His prosthetics on nose suits his character. He looks raw, fearless and a crooked don from 1970s. He plays the role of Arun with full honesty and conviction. Nishikant Kamat does an amazing job as a tough cop. Aishwarya Rajesh is natural and has a good screen presence. Farhan Akhtar has quite a long role as Dawood, still wondering why the makers didn't promote him and thanked him for his special appearance in the rolling credits. However, he is watchable and looks stylish. If you like slow and dark crime dramas, then Daddy is certainly for you, but if you are seeking a pacy period thriller, then you will be highly disappointed. Daddy is nothing but one of the boring chapters of a history book.